Shirdi is best known as the late 19th century home of the popular guru Shirdi Sai Baba. religious place in Ahmednagar Dist. friends or corporate group. It includes one of the biggest wave pool, thrilling ride from 45 feet water slide ,rain dance and much more along with the nice food. Location : 15 min walking distance from Saibaba Temple. This Water Park is developed by Malpani Group. 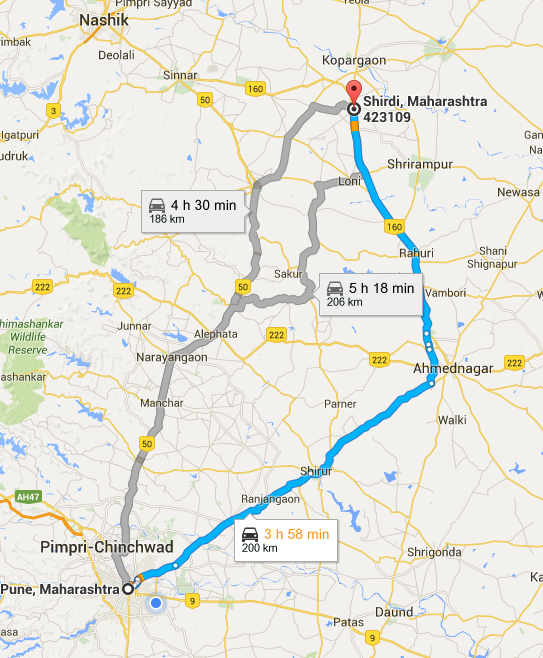 Distance from pune to shirdi 205 km. Distance from pune to Ahmednagar 120 km. Distance from Ahmednagar to shirdi 85 km. Distance from Mumbai to shirdi is 296 km. By Car it takes 3 and half hour. There are buses available from Pune shivajinagar to shirdi. They take around 5 hrs to reach shirdi. Nearest railway station from Shirdi is Sainagar, Shirdi and is 2 km away. Kopergaon railway station is 16 km away from Shirdi. Manmad railway station is around 55 Km from Shirdi. click here for train details. -Try to reach early on weekends as there is lot of crowd. -Darshan passes are available online for 200/- per person here. Check it. – Check the aarti timings above.